No, the title of this article is not deceiving you. 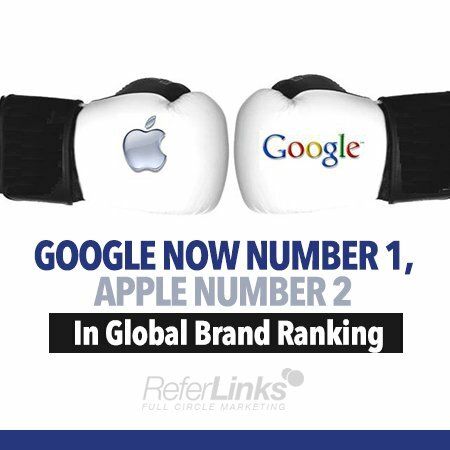 Apple has lost the coveted #1 spot in Millward Brown’s 2014 BrandZ Top 100 Most Valuable Global Brand ranking to Google. With their popular search engine now a much-coveted household word that’s repeatedly mentioned by both children and adults in many daily conversations, it’s easy to see how effective the marketing machine behind Google has been. It’s taken many years of hard work and perseverance, but according to Millward Brown’s 2014 ranking, Google is now viewed as the #1 Most Valuable Global Brand. When compared to 2013’s ranking, there was a 12% growth across all categories. Google showed a 40% rise, with their brand value for 2014 being $158,843m. On the other hand, Apple showed a 20% decrease from the 2013 BrandZ Top 100 Most Valuable Global Brand ranking, with their 2014 brand value at $147,880m. Apple previously held the number 1 spot in Millward Brown’s annual ranking in 2011, 2012, and 2013. Due to the 12% brand value increase across all categories, it “marks the shift from recovery to growth,” according to Millward Brown’s report of their annual ranking. Some of the other companies that showed a strong presence on the 2014 BrandZ Top 100 Most Valuable Global Brand included IBM (3rd), Microsoft (4th), McDonald’s (5th), Coca-Cola (6th), Visa (7th), AT&T (8th), Marlboro (9th), and Amazon (10th).